Punchirala Somasiri feels helpless whenever his oldest child asks for extra money to buy things for school. Most of the time he has to borrow money from a friend to give to his child. Somasiri was a successful farmer until a group of men forced him and his family off their land in Ampara district in southeast Sri Lanka in 2010. "The men wore masks and they set fire to our houses and the paddy field," says Somasiri who is now the secretary of Panam Paththuwa Protecting Organization, a local land activist group. He believes the men were working on behalf of corrupt officials. Around 350 families were displaced and the police kept them away from their land for a year, says Somasiri, who is Sinhalese. He says the navy ended up building a camp and a hotel — Panama Lagoon Cabana — on some of the land. Early last year, Sri Lanka's cabinet decided to release 340 acres of the original 365 acres back to the farmers. However the decision remains unenforced despite reminders being sent to the authorities from Somasiri's organization. Somasiri and his fellow farmer's plight is not an isolated case. Father Sarath Iddamalgoda, from the Archdiocese of Colombo, says that Sri Lanka has had land-grabbing issues for decades. "Since the 1970s there has been a rush of land grabbing. During the 1980s a lot of it occurred in the Moneragala district for sugar cultivation," Father Iddamalgoda says. 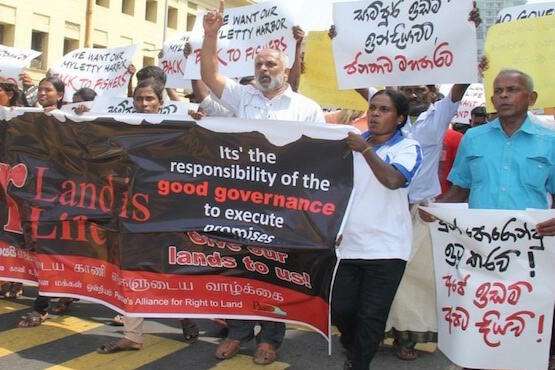 Land grabbing went into overdrive after Sri Lanka's 25-year-long civil war ended in 2009. Following the conflict, large tracts of land inhabited by Tamil communities in the North and East of the country were taken by the military, says a study by U.S.-based think-tank the Oakland Institute. Not only was the land taken, in many cases it was developed for commercial purposes. "The army has expanded nonmilitary activities and is engaged in large-scale property development, construction projects, and business ventures such as travel agencies, farming, holiday resorts, restaurants, and innumerable cafes that dot the highways in the northern and eastern Provinces," says the institute's study. "The army officially runs luxury resorts and golf courses that have been erected on land seized from now–internally displaced peoples," the report said. The Sri Lankan government says the study's claims are an exaggeration. During the reign of President Mahinda Rajapaksa president (2005-2014), government-supported politicians and the military forcibly acquired around 200,000 acres of land, says the Environment Conservation Trust. Activists point out that the land grab issue reveals weaknesses in the country's constitution, which does recognize the right to land ownership, says rights activist Herman Kumara, co-convener of the People's Alliance for the Right to Land. "No one should be evicted from their home or have it demolished, without a court order made after considering all the relevant circumstances," says Kumara. Lawyer Jagath Liyana Arachchi says the government needs to recognize that land and property is a fundamental right. "The constitution should be amended, so if rights are violated the affected parties could go to the court and file a case and get compensation," Arachchi says.